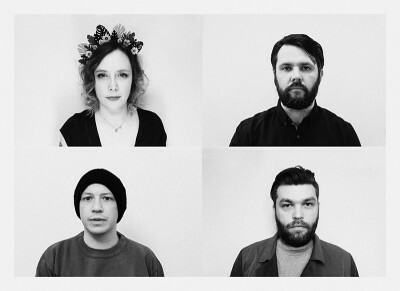 Through the modern wonders of an immaculate conception, the dream pop gods looked down upon the world and blessed us with Minor Victories. Recorded without ever being in the same room together, Stuart Braithwaite (Mogwai), Rachel Goswell (Slowdive, Mojave 3), Justin Lockey (Editors) and Justin’s brother, James, have crafted a 10-track release that is as epic, gorgeous and bombastic as any shoegazer could possibly hope for. “Give up the Ghost” is a haunted ballad with shimmering synths and heavy beats that drown under the buzz of fuzzed-out guitar grooves. It struts and swaggers with the cool confidence that sets the tone for the record. “A Hundred Ropes” follows with its oscillating keyboards and blissed-out vocals combining into a hypnotic effect that exudes an exotic atmosphere when the strings, snare and hi-hat layer over the pounding kick drum. Things take a cinematic turn as “Breaking My Light” soars in on swelling strings and thunderous drums before stripping back to focus on Goswell’s vocals for a song as angelic and blissful as anything produced by All About Eve’s Julianne Regan (one of the greatest voices in the history of music). Mogwai’s format of loud/soft/loud kicks in as the song ends with the volume being pushed back up. James Graham of The Twilight Sad joins the group for “Scattered Ashes (A Song for Richard),” which might be the most beautiful piece of music that you’ll hear this decade or the next. It’s the sort of pop song that is filled with enough beauty and sadness to inspire an endless amount of screenplays and novels. Euphoric is too tame a word to describe the otherworldly brilliance. Mark Kozelek drops by for a duet with Goswell in “For You Always,” the album’s weakest moment. Sonically, it sounds like a carnival ride with Kozelek phoning in a detached manner. It’s not a terrible tune, but it feels like an outtake that should have been shelved or released as a B-side. “Out to Sea” sees the group return to form with a piano- and string-heavy track that drowns Goswell’s voice deep in the mix. A wave of distorted guitars pushes the song to its peak before giving way to stillness. It’s just another gorgeous, transcendent moment. “The Thief” is cut from the same cloth as “For You Always,” but without Kozelek, it floats up into the heavens where it belongs, as layer upon layer is added throughout the track’s 7:26 running time.